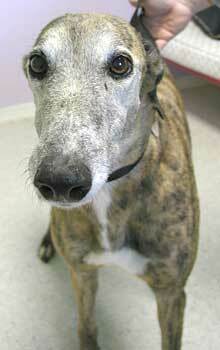 Sizzle, aka Sizzling Sue, is a beautiful 9-year old-brindle female, born February 1995. Her sire is Guy Kirby and her dam is Pink Fancy. Greyhound-data.org shows that Sizzle has no racing record, and that she whelped 5 pups in August 2001, with Gable Dodge being the sire. Sizzle has been a blood donor for the past 7 months. She has given of herself, and it is now time for someone to give her a loving forever home. It is not known at this time if Sizzle is small animal or cat tolerant. Early this afternoon I picked up Sizzle. I was told she was very playful and loved getting into the play-bow position with other dogs, especially the smaller ones. She came willingly with me to my car but did not seem to understand how to jump in. Sizzle let me lift her into the car and then shivered with fear all the way home. She ignored the dog treat I had for her in the car, not seeming to know what the Milkbone was. Sizzle occasionally paced in the back of the car, but did lie down for most of the ride. Once home she greeted the other 6 residents of Camp Lisa, tail wagging furiously. She ran all over the back yard, and seemed to enjoy the romp. Back inside the house I was able to get a closer look at her. She is a small, underweight girl who will be 10 years old in February. She will eat, but not much at a time. She will not take treats at all, probably because she doesn't know what they are. Her ears are caked with wax; her teeth need a good cleaning; and her rear toenails are horribly curved due to their length - all things that will be taken care of immediately, and will make her feel better. 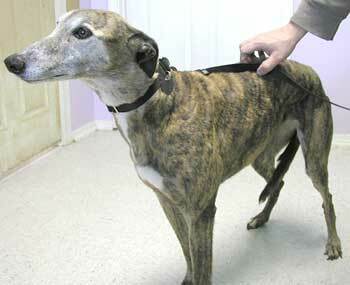 She is a beautiful brindle, with rich chestnut markings, and a sweet white face. The texture of her coat tells me she has been living outdoors. I think once she blows the coat she will be silky soft. After about 8 hours of gentle talk and touch, she finally started to approach me for attention, and is now comfortable enough to initiate petting sessions. She is using the dog door and has had no accidents at all in the house. She does seem like a protector, barking outside when the neighborhood dogs go into alarm mode. She has selected a dog bed, and sighs loudly whenever she collapses onto it! I feel that Sizzle will be an excellent pet once she adjusts to indoor life with regular food and lots of care and love. She is already showing that famous Greyhound forgiveness for the rough life she has led, and in less than 24 hours is rebounding from the fear and wariness I saw in her. Sizzle will make an excellent pet for anyone willing to give her the chance she apparently never had before... she deserves to know comfort, caring, love and security.